Anybody else remember the 70’s? I have such vivid memories of my mother making these bacon wrapped water chestnuts for just about every cocktail party, holiday or festive occasion. And since it was the 70’s, that was all the time. Hey – they created all kinds of awesome things in that decade – why not one of the most delectable little appetizers of all time? I have no idea why these fell by the wayside – I don’t remember seeing them a single time through the 90’s or early 2000’s. And I don’t remember what made me think of them a few years ago, but the first time I thought of them in 25 years, my mouth literally watered. I couldn’t wait to have them again, and they’ve been happily back in the fold ever since. 7;s too bad I don’t have company coming. I guess we’ll have to eat them all ourselves. Ha! Although in all honesty, these are so easy, and so quick to throw together, and the results are so delicious, I don’t mind throwing a batch together whenever company does come. Give these a try – they’ll either take you down memory lane, or give you a fresh take on an old favorite! Cut bacon slices in half. In a large skillet over medium heat, cook bacon until almost crisp, but still pliable. Drain. 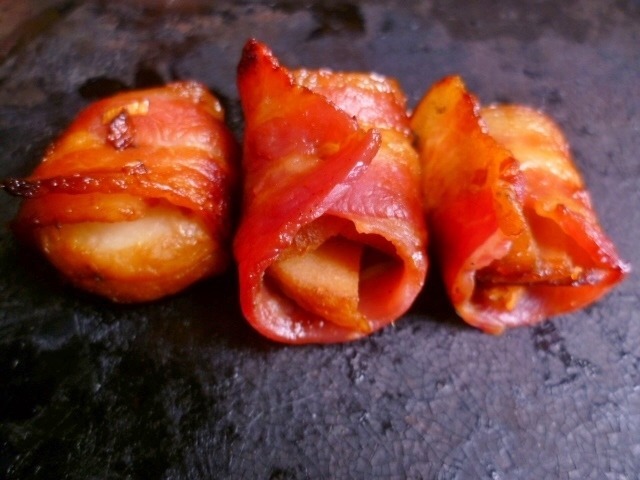 Wrap each water chestnut with a strip of bacon, securing with toothpicks. Place in an ungreased 9x13 inch baking dish. In a small bowl, combine the sugar, mayonnaise and chili sauce. Pour over the water chestnuts and bake at 350F for 30 minutes, or until hot through and bubbly.